I took some photos of the bog garden today, after I’d weeded it and raked and swept the path (for the first time in three years!). It has been a bad day for photographs as the sun is brilliant, and still quite low in the sky … so some of them are not as clear as they could have been, sorry. One of my lenses is better than another for this kind of work, but it isn’t good for sweeps of views, which is a shame. Never mind. Here we go – most of the photos are clickable into larger images, but some are not – I’ll indicate which ones these are. 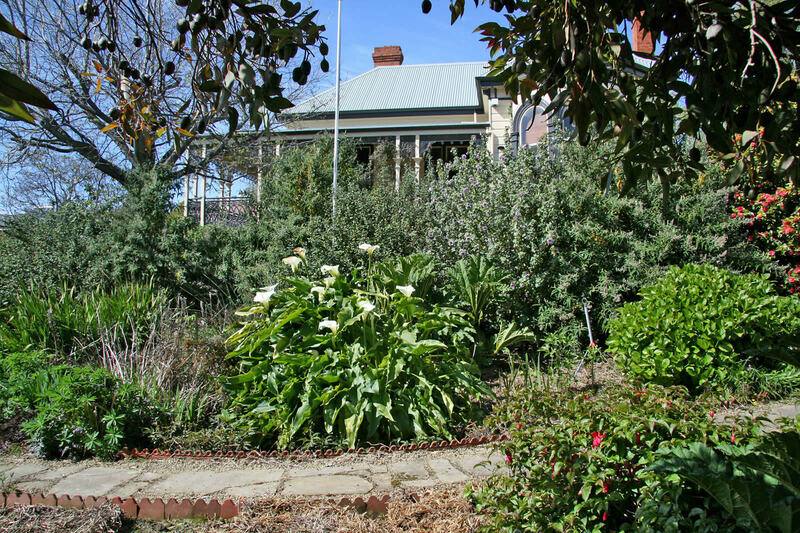 First, let’s see how the front garden has evolved over the years. Here is the garden about 2 summers ago when I had first planted it out. The large tree is a maple. Oh, how neat it was then! This is the same view now. 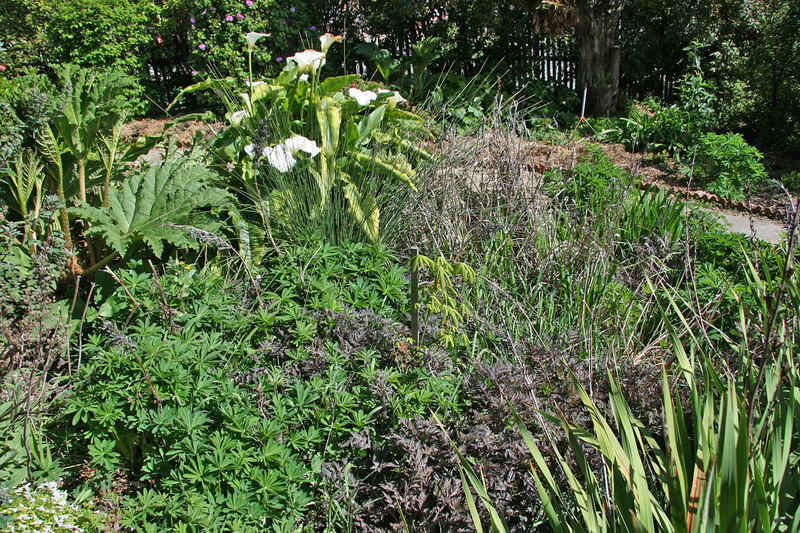 The bog garden is still young – by summer it will have grown considerably. Mostly it dies down over winter. This is an overview of the heart of the boggy bit. 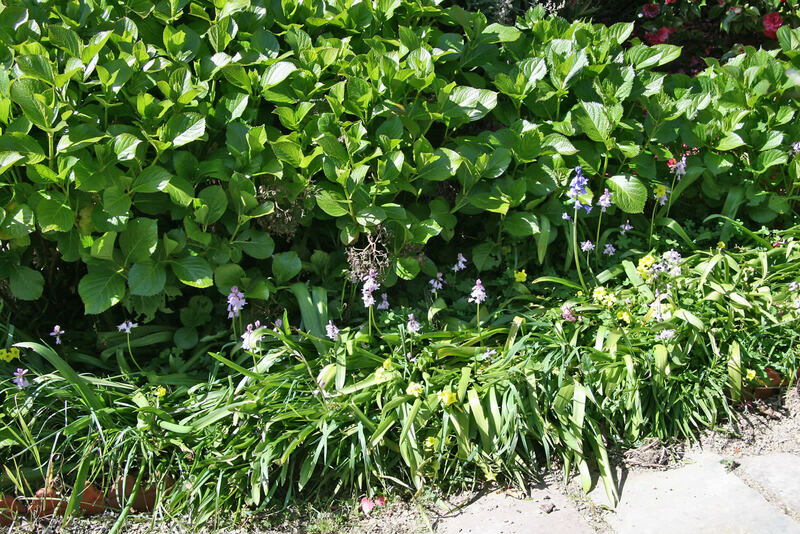 It is a mess – deliberately so as most of these plants self-seed and spring up all over the place. But it is also so dense that it is hard to spot individual plants! 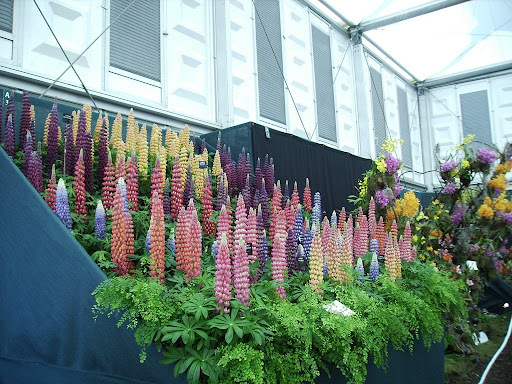 The mass of the bright green, circular leaves are russell lupins – they are still tiny and will grow into 2 metre giants by summer (see this photo of russell lupins at their best). The bronze feathery leaves – I have forgotten what those are. I originally planted one. It produced a single flower then died so I pulled it out. Imagine my surprise then when in subsequent years its children have sprung up everywhere! They have graceful arching pale pink flowers. 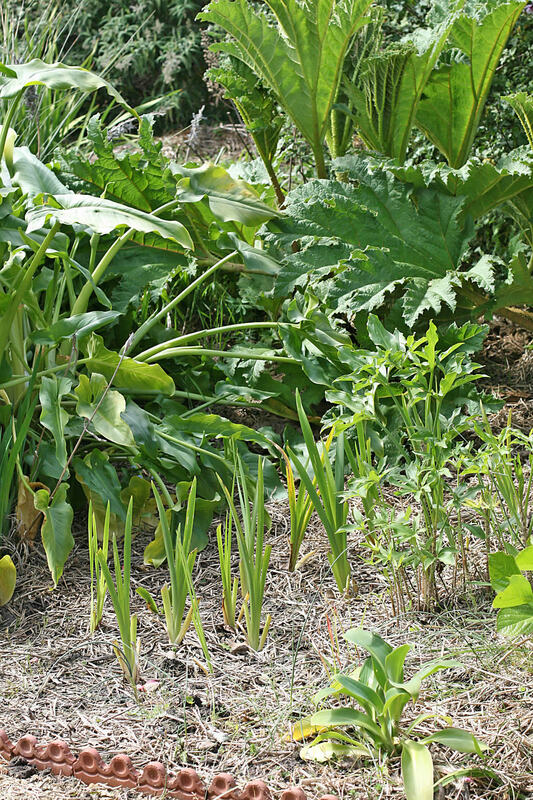 There are also poker reeds, siberian iris just starting to poke through, arums (the white flowers), a gunnera to the left, and in the right foreground the strappy leaves are watsonia. And the thing by the stake with the droopy leaves is a sweet chestnut – it isn’t in a good spot, who knows if it will survive. This is the other side of the arum, so looking back to the boggy bit from the central path. This still has to catch up to its other half, which is so wild. There is the arum, the gunnera, the new bog iris, dragon arum and a pineapple lily (struggling in the wet conditions). Some pink and bluebells under the hydrangeas. This massive camellia guards the entrance of the bog garden from the front gate (it also hides the house). 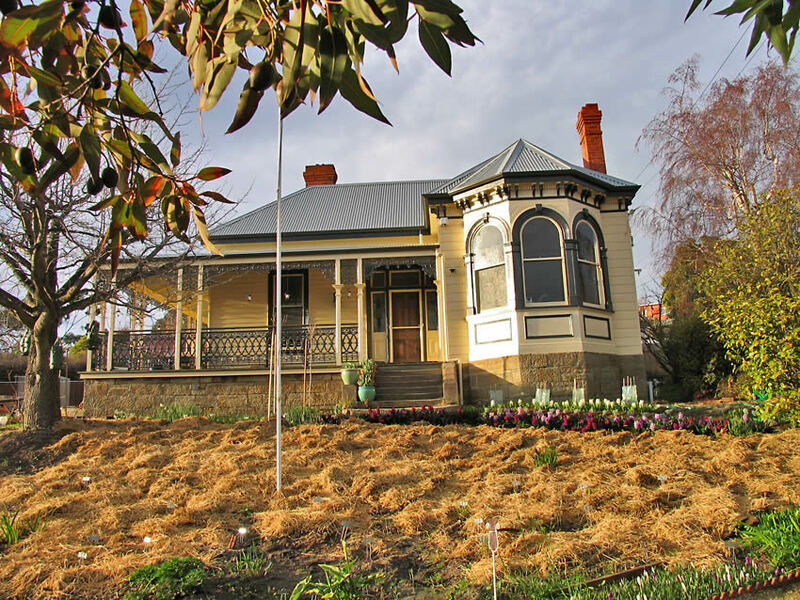 It is just past its best flowering – ten days ago it was smothered in dark pink blooms. And a couple of photographs from elsewhere in the garden. One of the clematis Montana Rubens on the eastern veranda (I planted out the new one yesterday evening). Some pretty daffodils (not clickable). 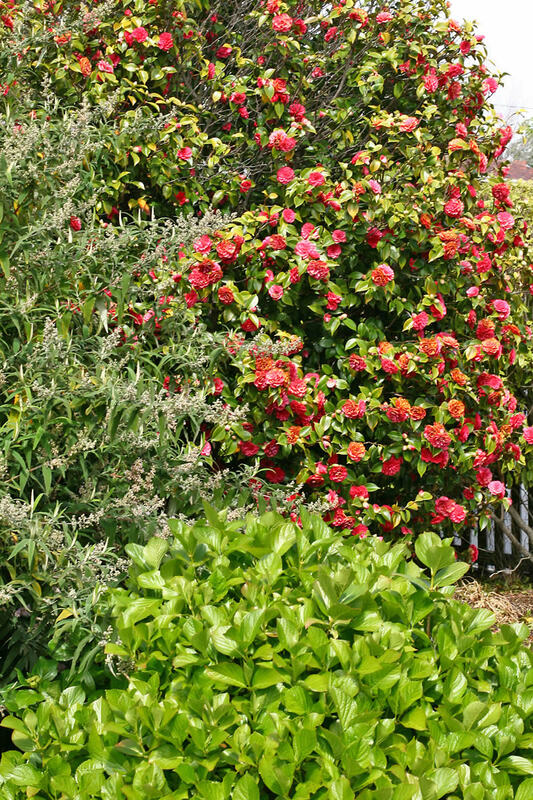 Is that camellia a Sasanqua Sara? I have no idea. I am not a camellia person, thus I have no curiosity about it. The thing is lucky to still be there as I told the landscapers when they were driving about with their bobcat ripping things out that I wouldn’t mind if the camellia went, too. They were horrified and refused to take it out (which is a good thing, really). I just googled Sasanqua – they flower in autumn and early winter, while this one flowers in early spring, so doesn’t sound like it. I was thinking about you today, so thought I’d pop by and say hello. 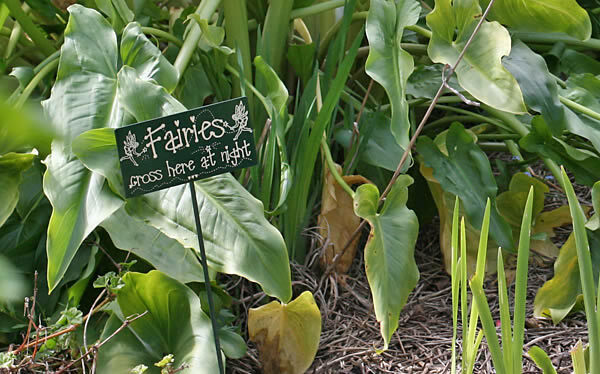 Looks like your garden is truly thriving! You’ve put an amazing amount of work into it. I’m adding you to my google reader so I can keep up with your updates. There’s so much to see there, and so much of it doing so well. You look to have enough of a range to be getting all kinds of colourful surprises throughout much of the year. Well done, Sara! Your photographs are beautiful. Thank you for sharing them with us. It’s funny to me that we are in early fall, and your world is greening and blooming! Much energy and love have gone into your plantings. Take care! What a gorgeous garden, and those daffodils are breathtaking! As much as I love fall, these pictures are making me long for spring already. Hi Sara, I have really enjoyed reading about your garden. Even more so I have a great appreciation of your blog. Thanks for sharing and all the best. Wow, what a transformation. 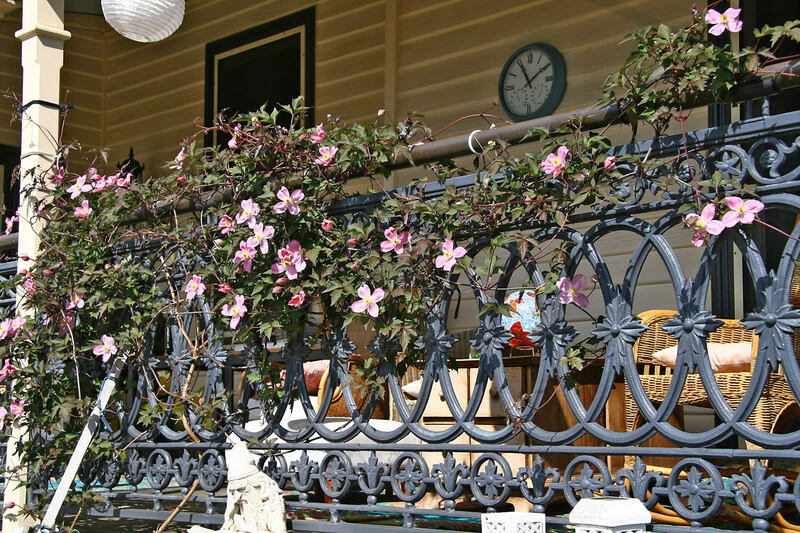 I love your use of Clematis Montana Rubens on the veranda. I love Montana for their speed of growth and wonderful displays each Spring. Well done! It is nice to come back to still pictures of the bog garden after watching the video – for the details – and it is a nice way to compare then and now. Wow, what a transformation, your plants have truly flourished! 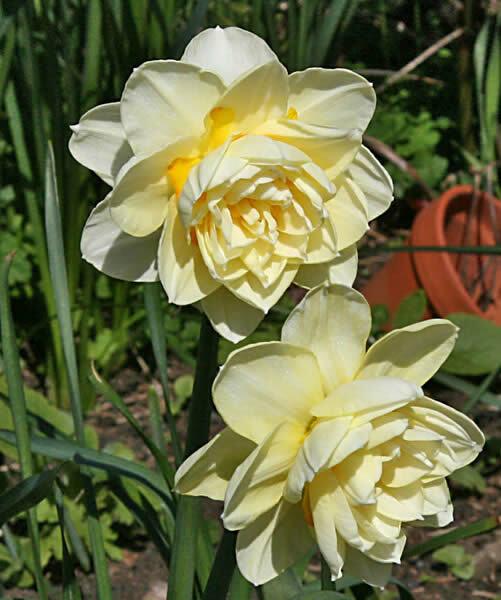 I love the pale cream daffodils, love their serenity and humble demeanour – just enjoying the warm sunshine, quietly. They remind me of my peach daffodils – they did not do well this last Spring. I would like to copy your picture of the cream daffodils and I am asking for permission to download.